Troy Paff is a filmmaker, photographer, designer, and the principal of Cuyahoga Productions. He is a two-time Emmy nominee for his work on the Discovery Channel's DIRTY JOBS WITH MIKE ROWE (Best Cinematography in Reality Television) to which he contributed over the show's eight year run. He recently concluded two inaugural seasons on Mike Rowe's SOMEBODY'S GOTTA DO IT with CNN and is a DP on Travel Channel's BIZARRE FOODS WITH ANDREW ZIMMERN. 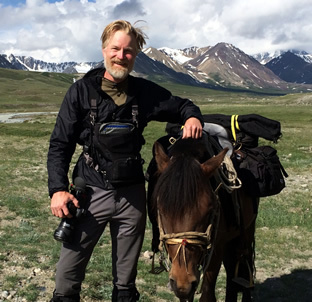 Troy is regularly employed as a director of photography in nonfiction reality television, working on adventure shows for networks like Discovery, History, Nat Geo, Sundance, et. al., traveing to exotic and/or extreme places around the globe to capture the spirit of adventure behind our best human pursuits. From the summit of Kilimanjaro to Mongolia by horseback with esteemed expedition company TUSKER TRAIL, if there is some daring behind a project, all the better. In the film world, Troy has has been involved in the development and/or production of independent feature films such as PAVEMENT ENDS (AMPAS screenwriting semifinalist), NANA CARMEN (Sundance Institute semifinalist), and LOOKING FOR OSCAR TIBS. The documentary SLIDE RANCH: WHERE THE BAY AREA GETS DOWN TO EARTH premiered at the Sisqiyou Environmental Film Festival in Ashland, Oregon and has gone on to raise charitable funds for its not-for-profit subject. The NYU graduate thesis film BREACHED (producer), made its premiere at the 2005 Tribeca Film Festival, screened at the 32nd Telluride Film Festival, and ran in a slate of film festivals around the world. The hi-def feature THE NAKED APE (producer) is now in release on home video after a lengthy film festival run. LIFELINE: TIBET (co-producer/co-director), a documentary project about a multinational expedition in cooperation with the government of China to treat Tibetan children with congenital heart conditions, has been successfully used as a fundraising tool for Variety Children's Lifeline. MOVIMIENTO (producer/director/camera/editor), a documentary of a youth delegation's journey to the jungles of El Salvador to collaborate with campesaños in their ongoingefforts to rebuild from their civil war, and while upholding the principles of martyred Archbishop Romero, advance the examples of peaceful leadership and responsible resource management in Central America. It has been used as a fundraising piece for its non-profit subject. ALEXANDER'S CLIFFHANGERS (co-producer, co-director) documents the climb of Mt. Shasta by a team of volunteer fundraisers. It has been used as a charitable tool. As a contracted camera operator, Troy has lent his skill to projects as diverse as SWAT team competitions to a distinguished author interview series for the National Endowment of the Arts, THE BIG READ. In 2010 Troy began a photo essay series examining the tradesmen of the 21st century. THE JOURNEYMAN PROJECT is ongoing, a labor of love and an expression of regard for the spirit of the American worker. The project is a result of spending eight years as team member of DIRTY JOBS and meeting scores of tradesmen, craftsmen, artisans, and those unsung workers whose efforts express our country's reputation of quality and determination in spite of the economic challenges of our time. The photo essay features portraiture of the tradesman at work, and includes text in the narrative form of a blog. To visit the blog, click here. The breadth of Troy's experience includes most aspects of film and video production, from small industrials and educational projects to full fledged features, live broadcast and stage productions, fine art and documentary photography, web site design (including associated concepts related to search engine optimization), and mastery of a many software applications. As a basis for these skills, a solid foundation of graphic and educational design exists at the heart of every project to broadcast that project's message. Troy's success in this regard has resulted in non profit and corporate clients of national import: the American Heart Association, the Democratic National Convention, the Telluride Film Festival, Oracle, Cadence, Pfizer, Lily, Pharmacia, the State Bar of California, and others. For a thorough list of clients and links, click here. Troy was born in 1968 in Cleveland, Ohio. His childhood was spent between Ohio and Arizona. In 2002, after a 13 year residency in Southern California, he moved to Taos, New Mexico. Troy's passions include rock climbing, distance running, bike riding, photography, adventure travel, film, and renovating his historic Taos home.